Two queens, two concubines, six princes. Innumerable hidden agendas. Yala, lady-in-waiting to the princess of a vanquished kingdom, must navigate their captors' treacherous imperial court. The Emperor's palace -- full of ambitious royals, sly gossip, and unforeseen perils -- is perhaps the most dangerous place in Zhaon. The lady Komor Yala has only her wits and her hidden blade to protect herself and her princess Mahara, sacrificed in marriage to the enemy, a hostage for her conquered people's good behavior, to secure a tenuous peace. But the Emperor is aging, and the Khir princess and her lady-in-waiting soon find themselves pawns in the six princes' deadly schemes for the throne -- and a single spark could ignite fresh rebellion in Khir. 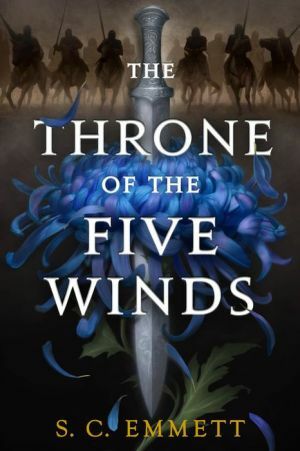 The Throne of the Five Winds is the first installment of the Hostage of Empire series, an intricate and ruthless East Asia-inspired epic fantasy trilogy perfect for fans of George R. R. Martin, Ken Liu, Kate Elliott, and K. Arsenault Rivera.